Do you understand your visitors? Simple information such as average length of visitor stay, peak traffic time, and a user’s navigation path is critical to webmaster success. Analyzing website traffic is not only interesting and fun, but can also boost profits and aid in delivering more relevant content. There are countless website tracking applications available. One of the most popular is Google Analytics (GA), a beefed-up version of Urchin 6 that has been on the market since 2005. A new player on the field, Woopra, offers several unique features that sets it apart from the crowd. Can it give Google Analytics a run for its money? After using GA and Woopra for six months to track my blog, I quickly discovered this question is much easier asked than answered. Here is my comparison of the two. Above: The dashboard in Google Analytics. Both Google Analytics and Woopra collect similar data. Like any analytics software, each provides the same dizzying array of visitor information — number of page views, top referrers, visitor language, browser setting, and more. If you just want to know how busy a site is or how visitors end up on a certain page, either tool will suffice. 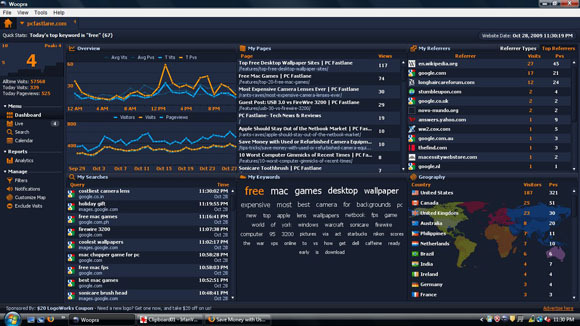 Above: The dashboard in Woopra. The first difference between Google Analytics and Woopra one notices is that the latter runs as a desktop application, while the former is web-only. Woopra does have a basic web version available, but the full experience comes from the desktop client. Because it doesn’t run in a web browser, more screen real estate is available to display statistics and performance is a bit better. Where ecommerce is concerned, GA wins hands-down. One of the most-touted features of the service is the ability to interface with AdSense and AdWords. It can show which pages are earning the most money and reveal just what those expensive AdWords visitors are doing. Action-based reporting is also available. This feature keeps track of specific visitor actions, such as the adding of an item to the shopping cart. Above: Live visitor stats in Woopra. A clear advantage of Woopra over GA is real-time tracking. GA can take many hours to update, but Woopra is instant. In fact, the desktop client has an entire pane devoted solely to live visitor stats. It shows the geographic location of guests, what pages they’re on and which ones they’ve visited, operating system, browser, and more. You can also tag and chat with live visitors. 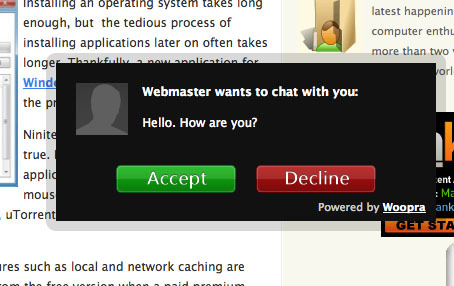 Above: Webmaster-to-visitor chat invitation (Woopra). 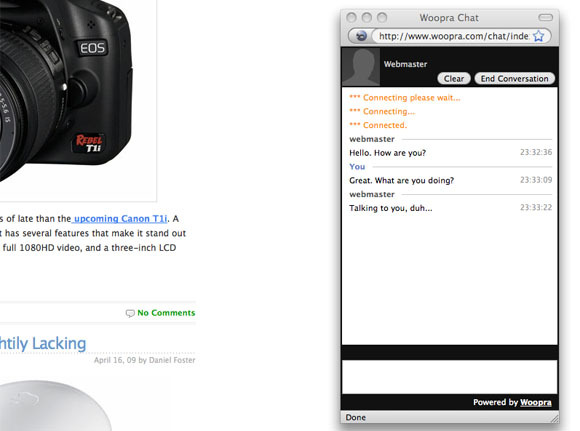 That’s right, you can communicate with visitors through Woopra. By clicking “Start Conversation” in the client, a message appears on the visitor’s screen requesting permission for a chat session. Once the guest gives the green light, the online chat begins. I don’t see much use for this feature on a blog or news site, but it might be handy for an online store. Above: Woopra chat in session. Just as important as features in a program is the interface itself. In short, Woopra offers a more user-friendly interface, but doesn’t have as many options as Google Analytics. Woopra is designed in such a way that nothing is ever more than one mouse click away. Its dashboard puts the most widely accessed data on one page. For those tracking multiple sites, a tabbed interface lets you quickly switch between URLs. While not rocket science, GA’s interface is more difficult to use than Woopra’s. Rather than allow access to everything in one click, Google Analytics requires the user to navigate through a group of menus and submenus. Instead of a quick tabbed interface, the web client uses an archaic drop-down menu. Unlike Woopra, GA does have a customizable dashboard, however. Users can drag and drop panes and choose from a number of chart types to display data as they see fit. Above: Google Analytics will count the number of craters on the moon and more… if you can find the menu option. A newbie unfamiliar with analytics software would probably have a learning curve of several days. In fairness, Google Analytics does offer quite a bit more tracking features. Woopra is simpler to operate because there is less under the hood to worry about. If Woopra and GA were contestants in a beauty pageant, Woopra wouldn’t even need makeup to win the crown. Its graphics are simply richer and the overall look more cutting-edge. When I was testing it, passers-by often commented that it looked like some sort of mission control center. Overall performance was better in my test, too. Google Analytics tended to lag a bit when loading menu items, but Woopra responded instantly to all requests. The web-based nature of GA makes competing in the graphics and performance arenas much harder. Above: Copy and paste is the only installation option for Google Analytics. Google Analytics blows Woopra out of the water where cost is concerned. GA is free for anyone with a Google account and will track a large number of page views for up to 50 sites. When I started using Woopra six months ago, it was in beta and free for testers. Halfway through writing this review, however, the developer released it for general use and modified the price structure. A free version is still available, but with major limitations. Freebie accounts are restricted to 30,000 page views a month and data is only stored for 3 months. Small text ads appear at the bottom of the client. For $4.95 a month, the limit is upped to 100,000 page views and ads are removed. Considering that Woopra updates in real-time and offers such a great user experience, I would be willing to pay this fee if only for one thing: data is retained for only 6 months. Pricier plans store data longer, but even the $49.95 Platinum plan, which tracks 1.25 million page views a month, only keeps statistics for 24 months. Considering the low cost of storage and the importance of long-term visitor data, this is unacceptable. The limitation can be bypassed by manually exporting data, but this is tedious and forces the user to keep track of the files. While not as streamlined as Woopra, Google Analytics stores data forever at no charge. If Woopra removed the data storage limitation, I would say it is a viable alternative to Google Analytics. In its present state, I would only recommend it to owners of smaller sites who qualify for the free version. I think the fact that it offers live tracking, plug-ins for CMS platforms, and such a cool interface makes it great for webmasters starting out. Analytics isn’t perfect. The interface is a bit clunky and stats can take hours to update, but it offers the best bang for the buck. And who is to say Google doesn’t have changes in the works? The company is constantly updating its products these days. Few of Woopra’s features are actually new, but the implementation of them as a whole mark a major step forward in the otherwise ho-hum world of web analytics. As a final note, Woopra and Google Analytics aren’t the only popular analytics services available. There are far too many to name, but other popular choices include Mint, OneStat, and Omniture. Yahoo also has a Google Analytics competitor. Think your favorite traffic stats software is better? Sound off in the comments. Daniel Foster is a technology blogger and photography enthusiast. In addition to developing websites, he operates his own computer blog, PC Fastlane. Thanks for the side-by-side comparison. 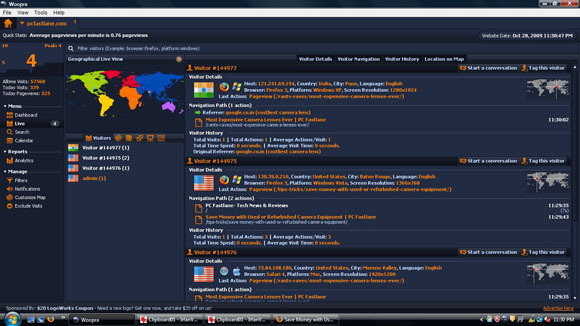 As you stated, one of Woopra’s biggest features is the real-time desktop interface. For many web properties I work with, one of the common requests is the ability to see in real-time who is visiting, where they are going, etc. I think this is a major plus for Woopra and one of the reason I’m starting to recommend it to a lot of folks. 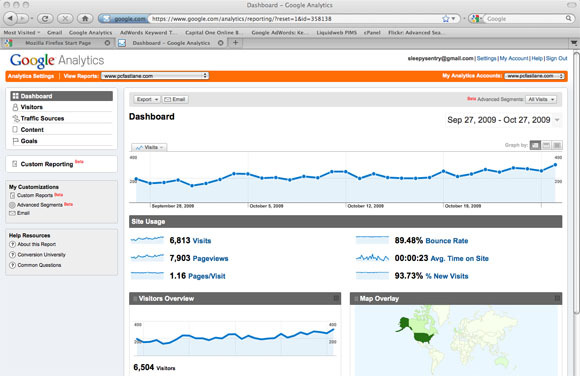 Secondly, Google Analytics is great — if you have someone on staff that can understand that data. Woopra is a little more user-friendly for the smaller sites out there, and I can see it even being used with bigger sites to help show real-time data for certain segments of the site. Competition is always good, and Woopra definitely is some good competition worth checking out! One area that might be worth the cost of Woopra over GA is whether GA is slowing down your site pageload. Full disclosure: Woopra uses us (Edgecast.com) to deliver their JS files. In 100s of performance tests we run for our clients and prospects, we notice that 3rd party referrers really drag down overal site performance. Ensuring that your analytics tool is not the culprit, may be worth the $5/month alone (especially if you’re an ecommerce site). This is an excellent comparison of the two services. I would like to add a couple of things which might make a bit of a difference as well in the grand scheme of things. First, as you’ve probably seen since you were part of the beta test, Woopra is maturing and adding new features regularly. GA has been fairly stagnant for years. And you can expect to see us continue to roll out new features going forward that will simply become available to Woopra clients as part of the routine updating process. Secondly, a clarification on the data retention. There are two different types of data that Woopra archives. We have all that boring stuff that you were referring to such as browser types, pageviews, etc. – and this data will be retained forever, because it can be archived and kept as reports in the same way Google does it. The second type of data is the much richer, fully segmentable, and non-archived data that allows for highly customized reporting which even GA cannot match. In order to achieve the segmentation capability every single piece of data must be kept in our database along with it’s relation to every other, and this is extremely costly. It is this level of data which is only kept for the retention period listed in our paid plans. So, for example, in a year, you could always go back and look and see how many visitors you had in a given month. Or what browsers they used, etc. But if you want to be able to go into the Search tab and see the entire click stream and every visit associated with a particular user who made a purchase on your e-commerce platform, well for that data you would need to be on a paid plan. Hope that helps a bit. But again, great review and I appreciate the balanced opinions. Very useful, thanks. Whilst I was head of IT for a major retailer we assessed moving away from our existing tracking system (Coremetrics) to GA. What stopped us was the delay in getting data – large businesses run on instant customer data these days and if you don’t get any feedback during a one-day major campaign, you are in trouble. John, thanks for providing the clarification regarding data retention. Taking a look at the upgrade page on the Woopra site, one simply sees “data retention” followed by a time period. Perhaps you should indicate that this only applies to segmented data? It’s easy to see how a customer might get mixed up as no information about what type of data being retained is present. In addition, have you considered giving users the option to export this complex segmented data and store it themselves? Woopra is a great piece of software and I look forward to seeing what features the development team rolls out in the future.